People have been telling me I should write these things down. I went through facebook and pulled some things out. I am so proud of Zeke. He wrote this by himself without guidelines. I did tell him the next letter though. I have a lot of fun things to do. like playing outside and with my toys and colouring books". So I asked Dave if he wanted a beer. 20 minutes or more go by and I hear a "mommy, mommy" coming from Zeke's room. "you havent gotten me a beer yet"
"mommy I need my bum wiped. I pooped outside like a dog"
"when I grow up I will wear my cowboy costume, and wear my cowboy hat and be a cowboy. then when i grow up again i will wear my construction hat"
so I asked him if he will grow up 2 times. "yes I grow up 2 times. one time I be a cowboy one time I be construction worker"
Zeke would have made my mom proud today. we woke up from naps (not that he slept) but he said it was "tea time"
Dave says to Zeke that its almost freezing outside. Zeke replies "noooo its almost colding"
I think Zeke just had his first date. he wanted to call Katie Bast (his babysitter) and ask her if she was coming over tonight. She told him no, but she would be at the Talent Night at Church. Zeke then asked her if she wanted to sit with us. when we got to church there was music playing and Zeke cut in on the kid that Katie was dancing with to dance with her. Katie did eat dinner with us and took him over for dessert. so he called a girl, took her out for dinner and dancing and there are only 14? years between them. Well Zeke has started to use the saying " well, here's the thing". He doesn't really use it in the right sense but its still cute. yesterday Zeke started reciting the days of the week when we were in the car. I didnt know he could do that ! So I had to go wake Zeke up from his nap and went into his room. I thought he was under his blankets- so I lifted them up and no- he wasnt there. I heard snoring so I knew he was nearby. I checked in his tent- no. Zeke doesnt nap very often anymore. He will spend 2 hours in his room playing. One time after his nap was done he brought out his shark box and a pencil and said "look mommy, I make it pretty"
so we had to have a talk about where he colours and he understood that it was only on paper. The next nap time he coloured in crayon in a book and said "mommy, I colour on paper"
So today Zeke came and told me that he peed in his play room. Not unusual at all with a potty trainee. So I was cleaning it up when I noticed where EXACTLY he was. Z was looking at my earrings today and asked me "how did you get holes in your ears. it will be quiet in the house, or we will be watching tv and Zeke will turn to us, unprompted, and say "I love you back"
An ex-coworker of Dave's and I have become good internet friends. I have been with her (online) though some of her life's Journey as they moved to Philadelphia and then to Charlotte, as well as some personal struggles with secondary Infertility. I was also told (before facebook) of their Pregnancy!! That day I had gone to a quilt show and had bough an adorable charm pack. As we were talking and planning I asked about room colours (they are Not finding out the gender) and realized this would be PERFECT for a baby quilt for her. So I started with circles since I know they appeal to Kendra. A charm pack fits a CD very nicely. I traced and hand cut them all. I took a background square and folded it in half and took a folded circle and folded that in half to find the middle. I then eyeballed it to find the center. I did a zig zag stitch on it and that was a mistake. I should have stitched just inside the circle or fused them on or something. Her getting pregnant kicked my but a bit to get my quilting room cleaned up and useable. I like how it came out of the washing machine. After washing and drying I realized that some of the circles had pulled back from the stitches. I spent some time whip stitching them back down. I hope they stay and dont come apart later! I even added hand quilting to the inside of each circle to help hold things down. I split up the busy back with an animal pattern. I think it looks like a watering hole! I picked the grey to match the elephants- pretty good eh? I love how the circles showed up on the back! started Feb 4th. Finished March 11. We had such a hard time getting together! Finally on May 18th we met up at Five Guys Burgers and Fries and were able to see each other and I could give her her quilt! Big sister Sadie has nicknamed the baby "Fergus"
I am so super excited for you Kendra, Eric and Sadie! Fergus- You have a great family to be born into! Another school year is done. and that means End of Year Teacher Gifts. I wanted to have something that Zeke made AND something that I made - not just store bought. I got Zeke to paint and decorate some frames for his teachers. I tried to get a good smile photo as his teachers (and anyone else) have a hard time getting him to smile. So Zekes teachers got a decorated frame, a smiling picture of Zeke, and a tea towel. I took a regular tea towel and did some special stitches around the outside as well as putting a piece of fabric (that Zeke picked out) across the nearish bottom. and the picture I put in the frames. I happen to be an administrator for a Quilting Community over on G+. I got +Alex Veronelli from +Aurifil threads to donate a box of thread. We will be doing a giveaway when we reach 1000 members. Head on over and join us there. its a hopping group of fabric addicts all helping each other out. my best friend from Ontario finally came to visit for the first time. We have been in NC for 4.5 years already. wow- time goes fast! She mostly just blended into our lives but we did do a few trips with her in tow. here are a few photos from her time here. and playing at the park. before which we took a quick trip to Rock Hill SC and got Andrea another state. I was asked to make a quilt for a friend in Canada. 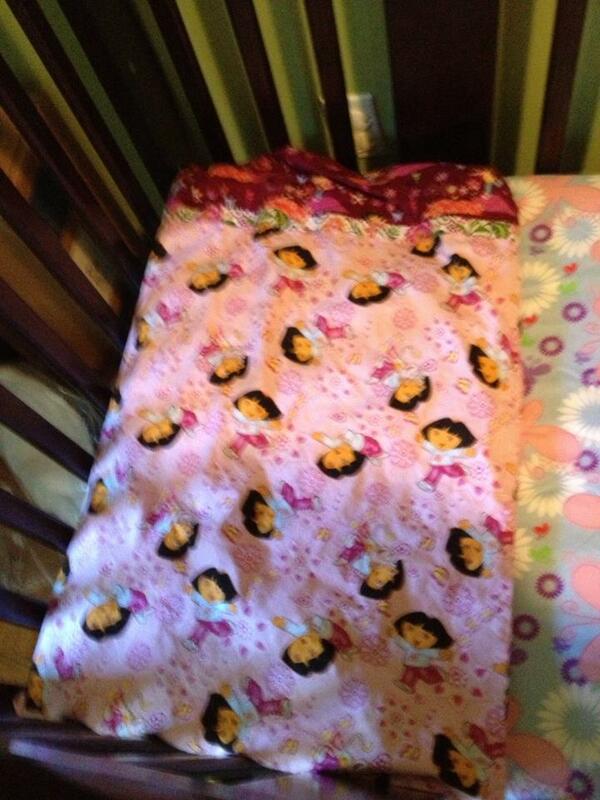 I had made her a baby quilt a couple years ago and they wanted one for when Rylee moved into her big girl bed. 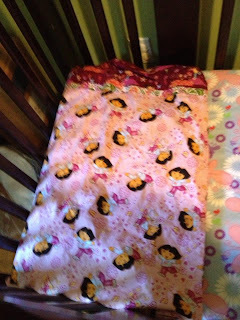 The request was for a twin Dora quilt with purple and maybe some green. My first thought was how to make it easy on myself since they didnt mind. I found a panel online of Dora and some butterflies. The panel includes the pink border as well. I then decided to do some checkerboards and add a couple borders. The reason the checkerboards are highlighted in different colours is because thats how I added them to the panel starting with the yellow. I had suggested a bit more of a non-dora back for the quilt so that this quilt can be used as she gets older by just flipping it over. I took a few yards and spread them out trying to get things as even as possible. I had the quilter (Pam Bowman) use her "Flutterby" pattern to quilt it with. It fit very well with the butterflies that Dora is chasing. It was suggested to me that I needed to label my quilts- and not just sign them. This is my first label and I hope it stays on! With some of the leftover fabric I made a couple pillow cases to go with the quilt. They just picked it up this week and are already loving it.